The primary sounding equipment is a Lowrance HDS unit with a Structurescan module. 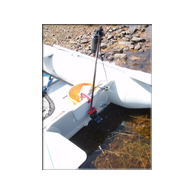 This utilises two transducers; both mounted on the transom, although the sidescan transducer is dismountable for use on a towed 'fish'. The towed setup is not used on the lake due to the nature of the geography, we'd do more damage and spend more time hauling it in and out than gaining any benefit. The maximum depth (so far) on the lake is 167ft, and the unit is very capable of giving excellent returns at that depth. Initial passes are made at 3-4kts on a "planned" grid (it doesnt often work out that way though) with the unit set onto 300ft range and 450khz frequency. This gives us a great overall picture of what is happening within 2-300 feet either side of the vessel. If anything interesting or unexpected is seen then a more 'in depth' survey at higher frequency (less range) is carried out. This is how we found "Trevors shallow" and the wreck at the Snadauns. The positional data is acquired with 2 GPS units (one for backup/check) which utilise EGNOS and standard differential corrections. The units update positional information approx 5 time per second. This data is is all collected, a days data amounts to several Gigabytes and analysed using Sonarviewer software from where it is exported as CSV data for further numbercrunching. Sidescan mosaics are constructed using DrDepth which has been found to be very capable. If something interesting and shallow pops up on the sidescan, we find somewhere safe to anchor and launch the inflatable for a close grid survey. Once the limits of a shallow or obstruction have been determined we then carry out a sidescan survey around it using the larger craft. So if you see a strange white and turquiose craft weaving around slowly in front of you, we havent neccessarily popped a bottle of wine open. You'll see a miniature Ball/Diamond/Ball displayed - so keep clear please! (yes....even fishermen!). For rocky, shallow or previously poorly surveyed areas of the lake we use primarily a Garmin GPSMap60Csx/GPSMap276c connected with a home made cable to a Garmin Intelliducer (0183). 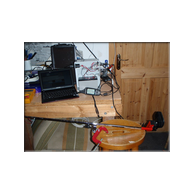 This is done through a homemade power supply/disribution box which contains a large rechargeable battery, a recharging socket, a fuse, a rocker switch and three RS232 connections – one supplies power and NMEA data to the the GPS, another receives the NMEA signal from the transducer and carries power to the transducer, and another is a NMEA Tx with no power connections for connecting a small netbook computer. 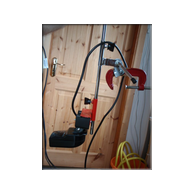 The transducer is mounted onto a pivoting and fully adjustable/removeable mounting bracket which started life as a metal artists easel. The system also has solar power backup, which doesn’t quite supply enough oomph to drive the transducer (it has to be small), but does a good amount of recharging. Without the solar charger the unit will run all day quite happily anyway (12 hours), logging depth data onto the GPS. 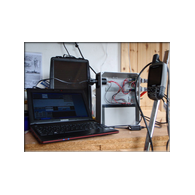 The netbook runs for 8 hours and can be recharged from the car or via the solar panel. The netbook runs Dr Depth BS+SS, NMEA Monitor, Mapsource, GPSMapedit, and cgpsmapper (for in the field chart updates). Dr Depth is customised to show the chart we are surveying/updating as the background image. GPSMapedit uses custom marine objects and skins to mimic a normal navigational chart, and the GPSM naturally runs the latest version of Corribcharts. This all fits into a bucket or small stacker box – which then sits nicely into a small (2.6m) inflatable which is equipped with a 2.5HP Yamaha outboard with a custom built stainless propguard.